Downtown Asheville is a great place to be! Our lively city center has gorgeous architecture, fantastic stores, a huge variety of 100 restaurants, interesting museums, fun street performers and many free festivals. 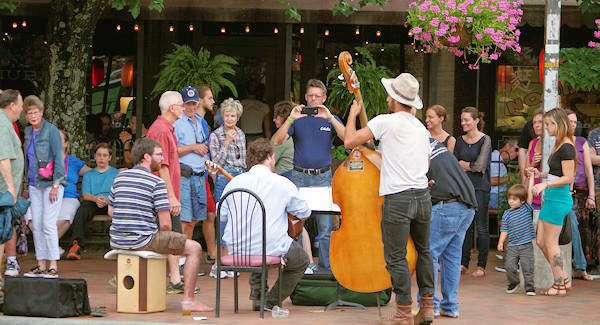 The diverse mix of culture, music and art has led to our city center being dubbed by many as the "Paris of the South." Downtown is a definitely a shopper's paradise with 200+ locally-owned stores and boutiques. You won't find tacky tourist shops. You could easily spend a day browsing the big variety of clothing, gifts, antiques and books. 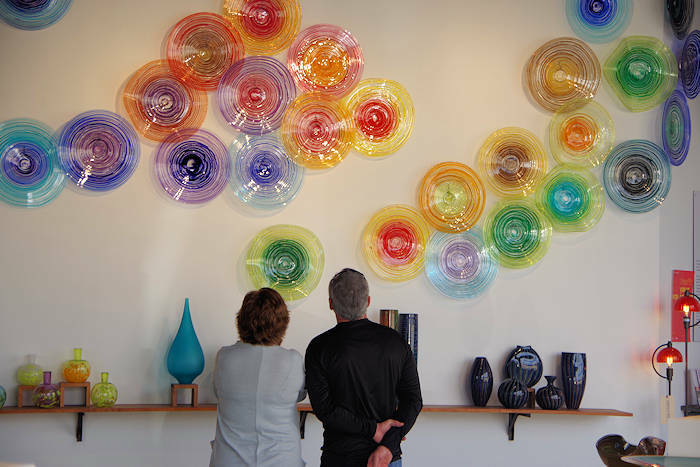 Find plenty of local and international creations in the many art galleries. Walk to many craft breweries, take a guided tour or picnic in the park. Pack Square is home to many of our favorite festivals for Spring, Summer and Fall. See our favorite things to do and places to see below, along with parking tips. Play, listen and dance at the Drum Circle every Friday night in Pritchard Park in downtown Asheville (except for winter months). All are welcome to one of the most diverse audiences you'll ever expereience. Tucked away a mile from downtown is an outdoor lover's playground. Fly on 11 ziplines through old growth trees with skyline and mountain views. Test your skills in a treetop playground. Climb trees or mountain bike. Plus, bring the kids for the first-ever Kid Zip course. See our feature. Stroll through this beautiful historic "mall" in downtown Asheville with high quality specialty shops and local restaurants. See local art and craft at the outdoor market. On the southside of downtown, explore the fast-growing "Brewery Distrtict" with eight breweries and a growing number of restaurants and shops, transitioning from sleepy industrial warehouses to a hip neighborhood. Award-winning jewelry designer and goldsmith Susan Marie Phipps works with the finest natural color gemstones, diamonds and pearls. Enjoy seeing Susan’s collection of elegant creations at her gallery/studio. 19 Biltmore Avenue in the heart of downtown Asheville. Grove Arcade: This renovated historic building is worth a visit to admire the architecture alone, but it's also a wonderful place to wander, shop or visit galleries. 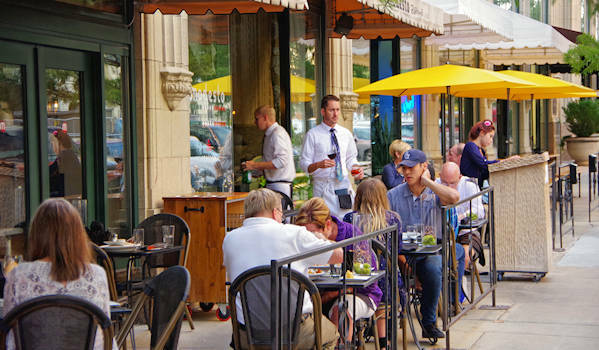 The dining options range from Chicago-style hot dogs to frozen custard, wine bars to coffee shops, upscale restaurants to sidewalk cafes. Haywood Street: From chocolate to contemporary furniture to wigs, you can find it all on Haywood. See the works of 150 artists at Woolworth Walk, browse Malaprops Bookstore and get your craft supplies at the Earth Guild. Wall Street: This picturesque side street features a mix of unique shops and some great restaurants like Early Girl and Market Place. Broadway & Biltmore: This street changes name at the monument, with Broadway to one side of Patton Avenue and Biltmore to the other. 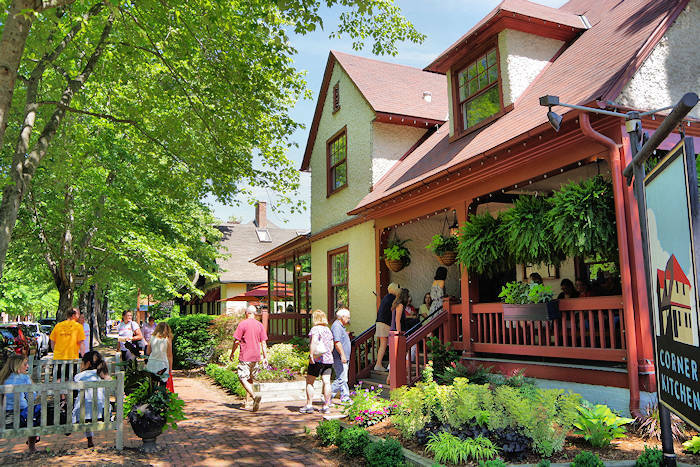 It is lined with local institutions like Mast General Store and Blue Sprial I gallery, along with many restaurants with outdoor dining. Lexington Avenue: It's described as "funky and eclectic" and "hip and happening." The street has adopted the motto "where world culture meets counter culture." See a map of downtown. The easiest solution to parking is using one of the five city & county parking decks. It's free for the first hour, then $1.50/hour. Get real time updates on spaces available in each deck! New for 2018: 8-story county parking deck opened at 40 Coxe Avenue with 664 spots- great for after 5 PM M-F and all weekend (nearest South Slope). Enter from Sears Alley. There are a couple of privately owned parking garages in Asheville downtown that are usually more expensive, but very convenient. There are more than 700 on-street, metered spaces in downtown Asheville. All meters are for short term parking (two hours or less, as marked) at a cost of $1.50 per hour. All meters accept coins only or pay via the Passport Parking App. The metered spaces are enforced from 8 AM to 6 PM, Monday through Saturday. Parking is FREE each Sunday and city holidays: New Year's Day, Martin Luther King, Jr. Day, Good Friday, Memorial Day, Fourth of July, Labor Day, Thanksgiving Day, Friday after Thanksgiving and Christmas (3 days). So don't "feed the meters" on these days.